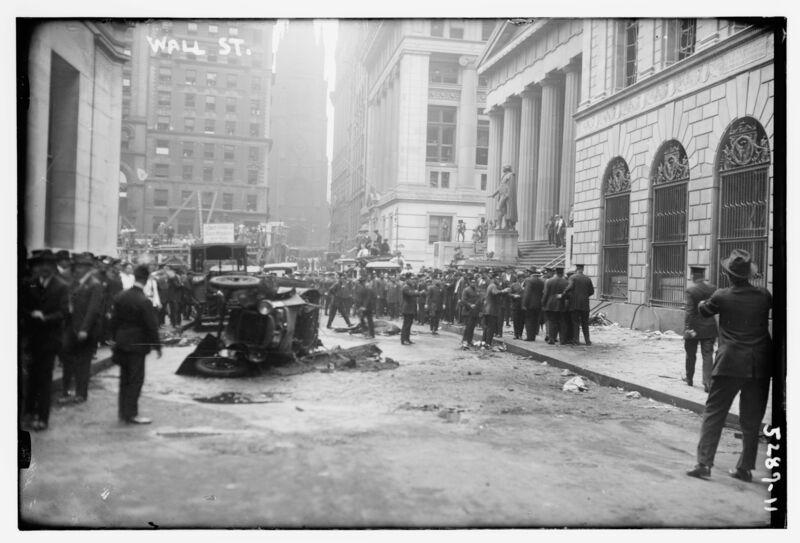 A horse-drawn cart packed with dynamite exploded at the start of noontime lunch hour in front of the Morgan Bank on Wall Street, NYC, on September 16, 1920. From AMERICAN EXPERIENCE: THE BOMBING OF WALL STREET. Photo courtesy Library of Congress. The parallels are unsettling. Immigrant profiling and deportation. American workers embittered by a profiteering moneyed class. Homegrown terrorists schooled in bomb-making and rhetoric by foreign-born anarchists. Russia vs. the F.B.I. As revisited in the fascinating new documentary, The Bombing of Wall Street, debuting on the PBS series American Experience tonight, Tuesday, February 13, 2018, 9:00-10:00 p.m. ET (online February 14 @ www.pbs.org ), it’s clear that the “hot topics” currently inciting angry debate and stalemate in D.C. are hardly new. In the years following World War I, wealthy American capitalists grew their coffers on the backs of those who fought and returned home from The Great War in Europe only to face grueling conditions and low wages in factories and coal mines. 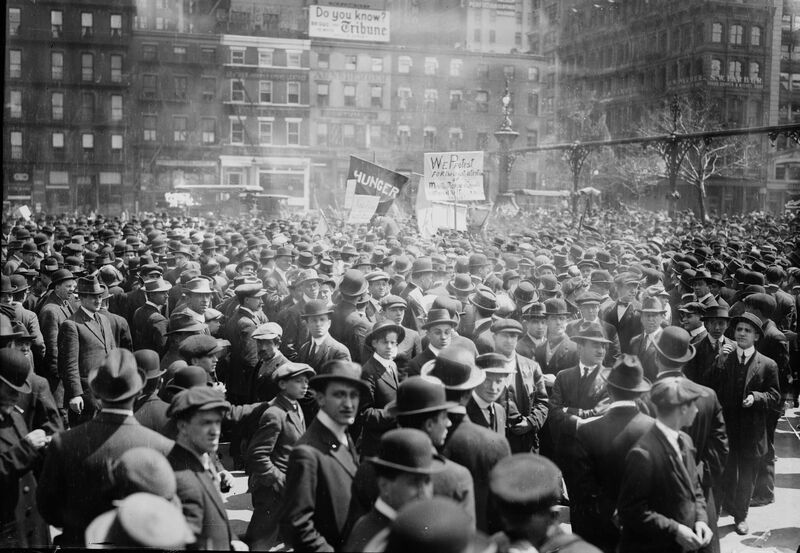 Anarchists (reportedly in dark hats) gathered in Union Square, New York City, May 1, 1914. Note Baker and Taylor Company Booksellers in the background. Photo courtesy Library of Congress. The outcome of the Bolshevik Revolution (November 1917) in Russia inspired workers of the world to challenge capitalism, unite and strike. Some took more violent means to get their message across. In April and May of 1919, 30 bombs targeting U.S. bankers and government officials were mailed to arrive on May Day. Attorney General and Presidential hopeful A. Mitchell Palmer ordered the Bureau of Investigation to draw up a list of possible suspects. Shortly thereafter, a bomb was delivered and exploded prematurely on Palmer’s front doorstep, scattering the bomb and the bomber’s remains hither and yon and generating fear for Palmer’s future well-being. Similar attacks occurred in six other cities. J. Edgar Hoover. Photo courtesy Library of Congress. Palmer retaliated by targeting anyone purportedly connected to revolutionary groups. He created “The Radical Division” of the Bureau and appointed a 24-year-old lawyer to manage it. Thus began the rise of J. Edgar Hoover, whose affinity for files had been fine-tuned during an early stint at the Library of Congress. With Hoover on board at the Bureau, more than 200,000 files on radical activities were swiftly compiled and, on the second anniversary of the Bolshevik Revolution (November 7, 1919), Palmer ordered a raid that led to the deportation of 249 Russian immigrants, a group that included anarchist Emma Goldman. More “Palmer Raids” were staged nationwide and suspected radicals were locked up en masse in deplorable makeshift detention centers. Many detainees were innocent, law-abiding hyphenate-American citizens. 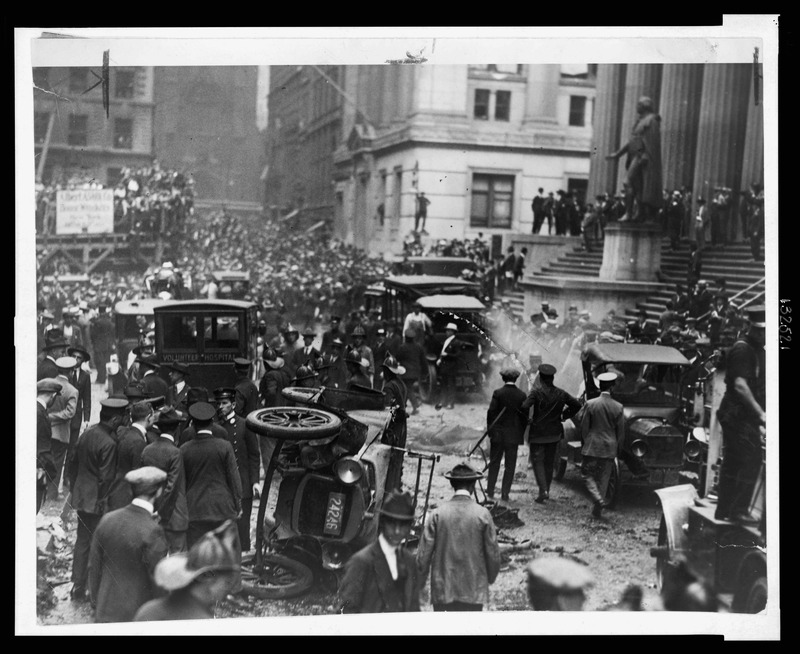 The culmination of this tragic period in U.S. history came on September 16, 1920, when a horse-drawn cart packed with dynamite exploded on Wall Street during lunch hour in front of the Morgan Bank–the world’s most powerful, family run banking institution. Thirty-eight innocent Wall Street employees and passersby were killed and hundreds more were injured. The bombs during that period were not unsophisticated: They ejected deadly shrapnel that shattered human organs. Other financial institutions across the country rightfully feared similar retaliation. A blown out car and dead horse are collateral damage as the police hold back curious post-bombing crowds in lower Manhattan, on September 16, 1920. Photo courtesy Library of Congress. Writer/director Susan Bellows managed to acquire and weave a remarkable collection of period film footage throughout her 52-minute documentary. The century-old footage is riveting as it captures and contrasts life on Wall Street before and after the September 16, 1920 bombing and documents the nationwide workers’ strikes and immigrant raids, roundups and deportations that preceded the bombing. The scope of the terrorist threats on American soil and the challenges to capitalism, immigration and the U.S. Constitution almost 100 years ago are eye-opening and chilling in light of similar debilitating challenges facing our country today. 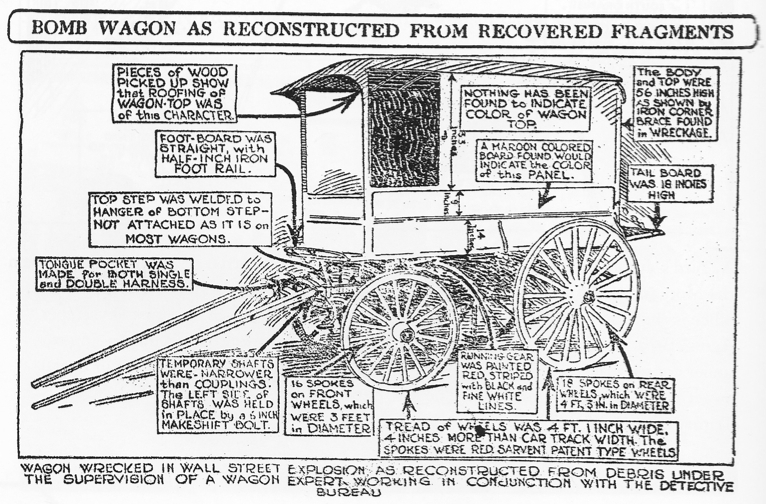 The September 16, 1920 Wall Street “bomb wagon” as reconstructed from recovered fragments. No suspected perpetrators were ever tried and convicted. Photo courtesy Library of Congress. The Bombing of Wall Street, based in part on Beverly Gage’s The Day Wall Street Exploded: A Story of America in its First Age of Terror (Oxford University Press, Inc., 2009), should serve as timely re-education and a wake-up call for all Americans. It’s a must-see for those who need “reminding” in the highest echelons of all three branches of the U.S. government. This entry was posted in Politics, TV and tagged American Experience, Beverly Gage, Federal Bureau of Investigation, J. Edgar Hoover, Mark Samels, Susan Bellows, Terrorism, The Bombing of Wall Street, The Day Wall Street Exploded, U.S. History. Bookmark the permalink. Thank you for this review. I will be sure to watch it! This sounds fascinating. We’re recording it. I really liked the “Bomb Wagon as Reconstructed from Recovered Fragments” illustration in your post. Thanks for bringing this to our attention. We watched it! Excellent film. Very interesting that Palmer started out as a liberal (or so it seemed). I guess having a bomb explode on his doorstep changed his thinking. Also interesting that there were a lot of people who were very critical of his methods. 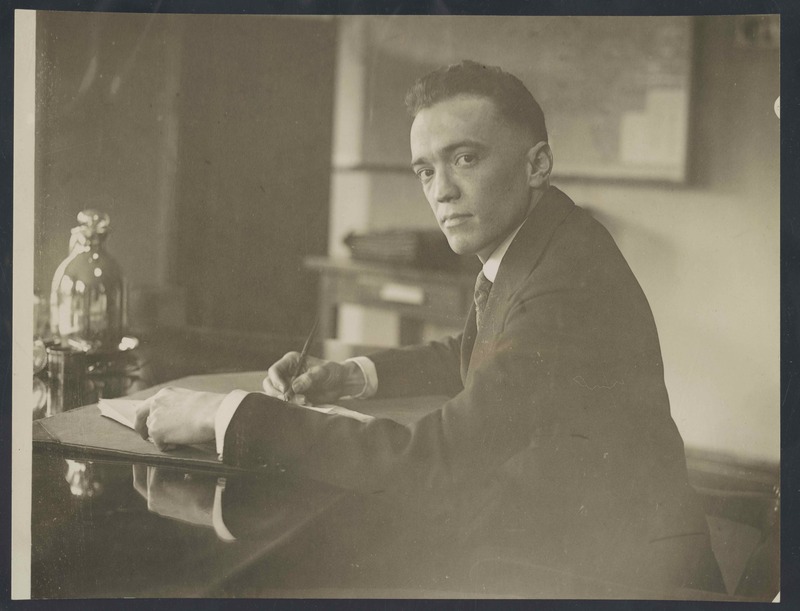 J. Edgar Hoover at that time is a very creepy looking guy. Something about the size of his head and his eyes. You’re right that this film is a “timely re-education and a wake-up call.” We’ve been there before.